When you hear "Big Chill" you are more likely to think of the 1983 movie, not a refrigerator. But, now you have something new to think of--a fabulous kitchen appliance in every color imaginable. I saw this fridge once in a kitchen spread and was finally able to locate the source. This is the type of fridge that tempts me to turn in my stainless steel for a more retro vibe...although that would require a new kitchen overall. Maybe in another house? another life? It's cute to look at nonetheless and I envy anyone who places this little beauty in her kitchen. Click here for more details and colors. Oh, and did I mention they offer matching stoves? Cuuuute! 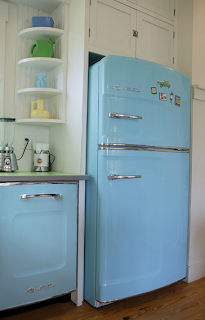 My dream appliance(s) in my dream beach cottage! I am sooooooo buying that if I ever get the Craftsman house I dream of. So amazing. It really makes me want to tear apart my whole kitchen!! dreamy, totally dreamy! We were going to redo our kitchen with someone's old fifties metal cabinets I hate that we did not wait for them. But baby number two came and I could not wait one more day for kitchen that actually function. Oh I wish I were more patient. By the way a few time zones shouldn't keep you from our show! I see you are in Utah, I spent 4 months working in the Cedar City at Utah Shakespeare festival and climbing through Zion. Oh what fun we had.